Arizona alumni had a huge weekend as well with some of our own competing at the USA Junior Nationals, and even earning spots to represent Team USA for the IAAF U-20 World Championships in Tampere, Finland. First, Cole Riddle of Arizona State took 2nd in the Men's Junior Pole Vault competition with a PR of 5.50 meters (18-0.5 feet). Last year as a student athlete for Valley Vista, Riddle set the high school State Record for the Boy's Pole Vault at 17-7. 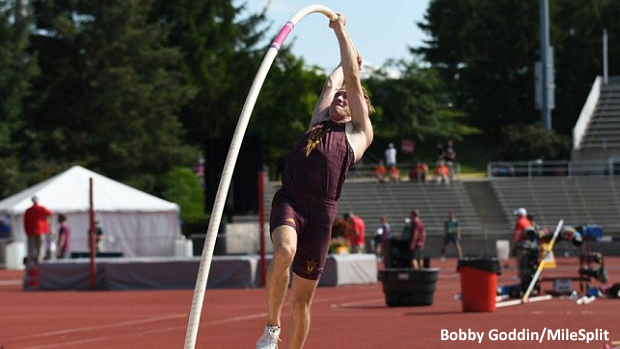 This year as a true freshman for the Sun Devils, Riddle stepped up his game with help from ASU Pole Vault coach Ron Barela. "I had never lifted much before that so we focused a lot on lifting and conditioning and then in season we focused a lot on sprinting and getting faster so I could transition onto bigger poles," said Riddle about his training over the past year. Back in April, Riddle cleared 5.35 meters (17-6.63) at the Sun Angel Classic to place 4th in the Men's Premiere competition. At practice the week before USA Juniors, he vaulted just over 18 feet and his performance at USA Junior Championships confirms his status as one of the best freshmen in the country. "It gives me a lot of confidence knowing that I'm doing the right things at ASU," says Riddle. "I just need to stay focused and hopefully the higher heights will keep coming." Hociel Landa, formerly of Brophy College Preparatory (Class of '17) and now attending Rice University in Houston, TX won the Men's 10,000m run. Unfortunately, while he secured the victory in 31:22.33, he did not make the standard of 31 minutes necessary to earn a place at the World Juniors. At the Victor Lopez Classic in March, Landa ran a PR of 31:14.20 for 10,000 meters. Landa said about his preparation for USA Juniors, "I was not extremely confident, but I was expecting to be at least top three the race. Not all my workouts were as good as I wanted them to be. However, the week of my race when I was tapering, I felt really good and excited to compete again." Though he may not have gotten the result he wanted out of the race, this season is still a success for Hociel Landa who learned to prioritize the additional academic workload at Rice to train properly and recover for races. "My freshman season was a great time for me to really know what I want from this sport. My goal is to be the best runner I can be, and I would say I am still learning valuable lessons to help me achieve that goal," says Landa. Also competing at USA Juniors in the Women's 800 meters, was Chandler High School's Morgan Foster. Foster qualified for the Final by running 2:09.58 in the preliminaries, which was her second-best performance of the season. She moved on to place 4th in the Final ultimately falling short of making Team USA. Elijah Mason, redshirt-Freshman for the University of Washington and Desert Vista graduate, placed 2nd in the Men's Discus with an opening throw of 199-5. Mason redshirted this year with the plan to get to USA Junior Championships and make the National Team. Mason said about working with UW Throws Coach Jason Schutz over the past year, "We focused on fine tuning the little things to keep the throw balanced." Mason's not too concerned about what the future may hold. He's handling his career one performance at a time. "I focus on becoming a better version of myself every chance I get and letting that one goal take me places I have never been before," said Mason. Turner Washington of the University of Arizona Wildcats placed 3rd in the Discus with a toss of 197-2. Umajesty Williams is another UA Wildcat who had a spectacular showing in Bloomington, IN where he qualified for the U-20 World Championships with a 2nd place finish in the 400-meter dash. In high school, Williams ran 47.66 for the 400m and was runner-up in both the 200m and 400m at the State Championships for Chaparral High School. This year, he's run sub-47 seconds for the 400m in each race since April. In the prelims, he ran a huge PR of 46.03 seconds and then returned to run 45.96 in the finals. Umajesty, or 'Maj' as his friends and family call him, says he's narrowed his focus at U of A, putting in much more work as a sprinter over the past year than he did for the Chaparral Firebirds. "I've never really trained consistently for this long at the highschool level because of football and a couple of injuries. I owe my success this year to consistency," says Williams. "Before I would train only those 5 months or so during track season." He explains that now he's trained for twice as long, which has yielded many more opportunities for him as a true freshman. Best wishes to Elijah Mason, Cole Riddle, and 'Maj' Williams as they fly out to Finland to compete for Team USA.